Pelosi may enter history as one of the great House speakers, according to scholars: “She may get a stellar entry in the history books, but that entry will not include the word ‘bipartisan,’ ” said John J. Pitney Jr., a political scientist at Claremont McKenna College…. James McPherson: As Texas messes with history, worry that it’ll multiply: A lot of attention has been focused on Texas in recent weeks, because state officials decided to rewrite social studies curriculum and force kids to learn a distorted view of the country’s past…. Niall Ferguson: ‘Rid our schools of junk history’: A leading British historian has called for a Jamie Oliver-style campaign to purge schools of what he calls “junk history”. Niall Ferguson, who teaches at Harvard and presented a Channel 4 series on the world’s financial history, has launched a polemical attack on the subject’s “decline in British schools”, arguing that the discipline is badly taught and undervalued. He says standards are at an all-time low in the classroom and the subject should be compulsory at GCSE. Historic moments in Dakotas by former SDSU professor: …In a new book, “Prairie Republic – The Political Culture of Dakota Territory, 1879-1889,” South Dakota native and historian Jon K. Lauck comes to Turner’s defense by chronicling what he calls the “genuine democratic moments” of thousands of settlers that he said were the seed and soil of statehood. Project to digitize Canada’s 1812 artifacts: Sarah Maloney has a passion for history. The Port Colborne resident, who has a master’s degree in history from the University of Western Ontario, was one of two people hired to by Brock University to carry out its 1812 Online Digitization Project. Princeton University: Symposium explores race and the Obama presidency Tuesday, April 13, 2010, 1 p.m. · Frist Campus Center, Multipurpose Room A: Princeton scholars in the fields of African American Studies, politics, religion, sociology and history will come together Tuesday, April 13, at the University for the symposium “Race, American Politics, and the Presidency of Barack Obama.” The event, which is free and open to the public, will take place from 1 p.m. to 4:30 p.m. in Multipurpose Room A of the Frist Campus Center on the Princeton campus, followed by a public reception. 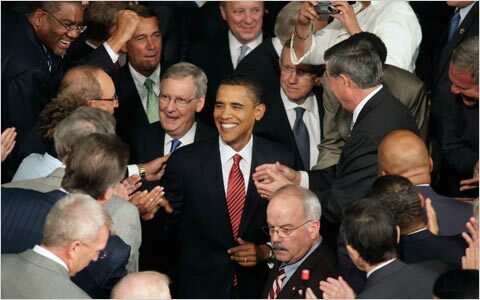 Stephen Crowley/The New York Times President Obama was greeted by members of Congress as he entered the House chamber. Obama Vows to ‘Deliver on Health Care’: President Obama sought to reframe the contentious debate over health care on Wednesday, asking a critical Congress and a skeptical nation to reach consensus on legislation to expand coverage to millions of Americans and lower costs through a sweeping overhaul that has eluded lawmakers for generations. Live Blogging the President’s Speech: ….What was true then remains true today. I understand how difficult this health care debate has been. I know that many in this country are deeply skeptical that government is looking out for them. I understand that the politically safe move would be to kick the can further down the road – to defer reform one more year, or one more election, or one more term. Analysis: Obama gambles on making nice, no vetoes: Barack Obama faces the same obstacles that plagued former President Bill Clinton during a health care standoff 15 years ago. But Obama took a strikingly different path around them Wednesday night, choosing the promise of compromise over Clinton’s sharp-edged veto pen…. Julian Zelizer “Obama’s speech: A simple message, a tough task”: Above all, he has to make sure he holds on to his liberal base, said Julian Zelizer, professor of history and public affairs at Princeton University. Julian E. Zelizer: Commentary: Obama’s moment of truth: On Wednesday, President Obama will make the most important speech of his presidency. We hear this phrase so much that it has become a cliché. But, in this case, the cliché is accurate. President Obama suffered a politically brutal month in August. The opponents of health care dominated public debate about the legislation circulating in Congress. Public approval ratings for the president and his health care plan, as well as the Democratic Congress, have fallen. Democrats have become internally divided. It is possible Obama could end his first year in the White House without a major piece of legislation beyond the economic stimulus. 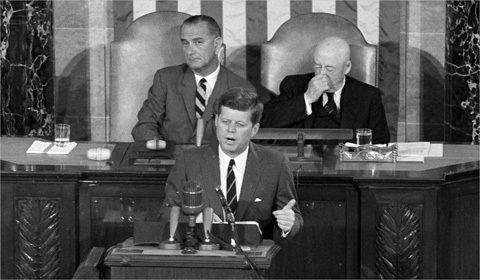 AP With Vice President Lyndon B. Johnson, left, and House Speaker Sam Rayburn, far right, President John F. Kennedy addresses a joint session of Congress in May 1961. A Bit of History on Presidents and Joint Sessions: President Obama’s health-care speech tonight is officially an address to a joint session of Congress. Such addresses are somewhat out of the ordinary but not all that rare. It was Huckabee vs. Douglas Brinkley on O’Reilly Show about Health Care Reform: Well, it’s never a mistake for a Democratic president to raise the specter of FDR and Kennedy for his base. I think the Lyndon Johnson comments gets more to the crux of the difficulty the president’s having. Obama Team Lacking Most of Top Players: As President Obama tries to turn around a summer of setbacks, he finds himself still without most of his own team. Seven months into his presidency, fewer than half of his top appointees are in place advancing his agenda. Ever the optimist, President Obama still hopeful for health care reform: By every obvious measure, health care reform is in deep trouble. But don’t tell that to the optimist in chief. In private, President Obama is even more bullish than his public posture – constantly rallying battle-fatigued aides with assurances that victory is inevitable. A Basis Is Seen for Some Health Plan Fears Among the Elderly: White House officials and Democrats in Congress say the fears of older Americans about possible rationing of health care are based on myths and falsehoods. But Medicare beneficiaries and insurance counselors say the concerns are not entirely irrational. New Rx for Health Plan: Split Bill: The White House and Senate Democratic leaders, seeing little chance of bipartisan support for their health-care overhaul, are considering a strategy shift that would break the legislation into two parts and pass the most expensive provisions solely with Democratic votes. The idea is the latest effort by Democrats to escape the morass caused by delays in Congress, as well as voter discontent crystallized in angry town-hall meetings. Polls suggest the overhaul plans are losing public support, giving Republicans less incentive to go along. Biden: I Know Bush, and He’s No Obama: Vice president jokes about former administration during a fundraising dinner when he responded to a suggestion that President Bush leaned heavily on Vice President Cheney for guidance. Obama stands by belief a public option is viable: In an interview Thursday with Philadelphia-based radio talk show host Michael Smerconish, Obama said that “the press got excited and some folks on the left got a little excited” when the administration last weekend made statements indicating that a publicly-run health insurance option was just one of several alternatives. On defense, Obama woos right, left on healthcare: With control of the healthcare debate slipping from his grasp, President Barack Obama pitched his ambitious plan to conservative talk radio and his own liberal supporters Thursday — and denied a challenge from one backer that he is “bucklin’ a little bit” under Republican criticism…..
Obama Calls Health Plan a ‘Moral Obligation’: President Obama sought Wednesday to reframe the health care debate as “a core ethical and moral obligation,” imploring a coalition of religious leaders to help promote the plan to lower costs and expand insurance coverage for all Americans.